Shawna Emmott is a part owner of our newest location in Stittsville, ON. 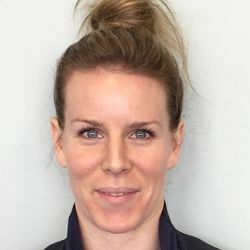 Shawna attended Queen’s University from 2002-2008, completing Undergraduate Degrees in both a Bachelor of Physical Education and a Bachelor of Life Science. She went on to complete her Masters of Science in Physiotherapy and has been working as a clinical registered physiotherapist since. Shawna has experience working with individuals of all ages, conditions and all levels of physical activity. She has taken several courses such as Manual Therapy, Advanced Aquatic Physical Therapy, Soft Tissue Release, Acupuncture, Functional Dry Needling, Mulligan Mobilizations with Movement, Functional Movement Screening, and multiple Taping Courses. She has played competitive sports throughout her life, and hopes to share her passion, through coaching, with her young athletic family. The Hydrathletics Ottawa team is looking for a part-time Kinesiologist to join their team. The successful applicant will be hard-working, well organized and have an interest in aquatic therapy. The Hydrathletics Kingston team is looking for a part-time physiotherapist to join their team. The successful applicant will be hard-working, well organized and have strong patient rapport. about our company, our vision, and what sets us apart from the rest.